Driving through the square in town today I noticed a person standing with a colorful sign held overhead. Her sign read, “Abortion kills babies.” I drove away curiously while pondering why on a frightfully cold day would someone choose to stand on a street corner and hold up this particular sign. While eating lunch I noticed while scanning my phone for some valuable bit of information that today represents the anniversary of Roe vs. Wade. Suddenly it occurred to me the rational for the lady standing out in the cold earlier in the day. I certainly respect the view of protecting life, I really do. Rather than grandstanding my personal views on the subject, at the moment all I can think about is this one quote. Not really sure who first said it nor does it really matter, but it’s relevance became pronounced as I considered the events of today. “If you want to have fewer abortions quit making it hard for women to get birth control.” Seems like such a simple statement to be filled with so much irony. Sadly, the same indignant folks who beat their chests over the horrors of abortion are the same people who want to limit woman the right to contraception. For the life of me I can’t get a handle over this bizarre logic other than it remains a means to control women. 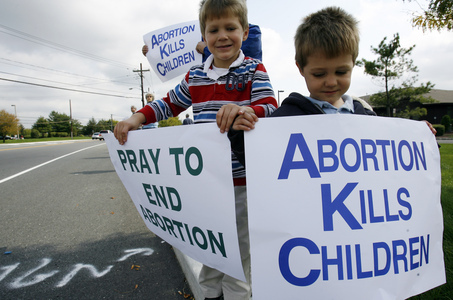 Maybe I should get a sign ready for the next time I see someone standing on a street corner concerned about abortion. Mine should say, “Easy access to birth control prevents abortions.” I wonder how my sign holding friends would accept me standing in their midst?